The new app from the Department of Transportation’s Federal Motor Carrier Safety Administration called “QCMobile” empowers U.S. motorists to make safety their highest priority on the roadways this spring. This is a continued theme in DOT’s mobile strategy, as they have also recently released the SaferRide app. QCMobile (QC stands for “Query Central”) is a free download for anyone interested in reviewing the DOT registration and safety performance information of motor carriers. 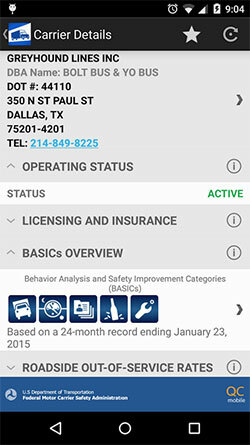 The app gives users more convenient access to currently available online safety performance information for interstate truck and bus companies. This means access to information on crashes, safety rating, roadside out-of-service rates, and much more. QCMobile is an especially valuable tool for law enforcement officers and commercial motor vehicle safety inspectors, as well as insurers, brokers, freight-forwarders and whoever just booked a discount bus ticket online. QCMobile is available via iTunes or the App Store for Apple devices and the Google Play store for Android devices.